Today we visited a local attraction called Dolphin House. It was built in 1993 by Ashley Saunders. This was a year after Hurricane Andrew damaged almost every house in Bimini. He decided he wanted a solid, hurricane proof house so he built Dolphin House. It has concrete slab floors and cinder block walls much like many Bimini houses, but there the resemblance ends. He has numerous poured concrete posts on the corners acting as buttresses. Then, he began covering all the exterior and the interior walls and floors with his creations from tile and various “found items” from the beach and remodeled marinas, resorts, churches and buildings. 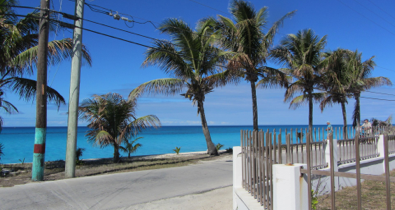 Mr. Saunder’s family has lived in Bimini for generations. He graduated from the University of Wisconsin and returned to Bimini to teach high school English and Social Studies. 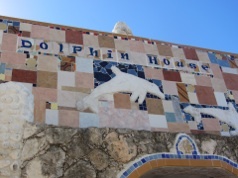 When he retired he began building Dolphin House. We took too many photos to put on this page, so click here to see a slide show of his intricately designed house. After spending two weeks here, it looks like we finally have a weather window to leave. We will not be going to Chub Cay in the Berrys, as planned. The wind direction makes it better for us to go to Frazer’s Hog Cay. It is 86 miles from here, so we will get up at 3 am and be out of here no later than 4 am. This should allow us to get to an anchorage at Frazer’s before dark. We hope to average at least 7 1/2 kts motorsailing. The wind direction will not be ideal and the waves will be a little higher than we are comfortable with, but we can’t trust that there will be better conditions in the near future. Of the eight sailboats who have been here with us these two weeks, four left this morning and are taking the same route we will follow. They are anchoring on the Bahamas Banks off the Northwest Channel tonight. Tomorrow they will continue on to Frazer’s Hog Cay. We could have done that, but the wind looked like we would be going straight into it at about 10 kts today. Also, we prefer to have a place to take Daisy ashore, and we can do that in Frazer’s. In addition, I like to have a phone signal to call Jennifer, which we wouldn’t have anchored on the Banks. So we’ll make the one day trip to Frazer tomorrow with a better wind angle, if the forecast doesn’t change. We’re not sure if we can get out of Frazer’s Hog Cay on Friday, but if we can, we’ll go to Nassau. If all goes well, we’ll leave Nassau on Saturday and sail to the Exumas, possibly Norman’s Cay, but we’ll have to look at the constantly changing weather each day. We will probably stay at a marina in Nassau, as the current is very strong in the harbor. We have anchored there twice, and never stayed at a marina. It wasn’t a pleasant anchoring experience. Two other boats with us at Bimini Sands are waiting until Sunday to leave Bimini and the other is not sure when they are leaving. The weather has been unusually unpredictable. Each day the forecast has changed. A day ago, it looked like Thursday would be a relatively calm day. Now, the calm days aren’t arriving until the weekend. Because our wifi extender is not working, our ability to get email and to upload blog entries will be limited for the next few weeks. We hope to get the wifi extender working in Nassau or Staniel Cay, and if not we have ordered an unlocked air card which will be delivered to us in Staniel Cay. With a Batelco sim card in the air card, we can buy data from the Bahamas phone company. We have been told that we will then be able to get a strong Internet signal anywhere in the Bahamas. This will be much cheaper and more reliable than paying for very limited data at various islands we visit. For example, in the Exuma Land and Sea Park it costs $15 for 100 mb for 24 hours. This may be our last blog entry for awhile, but our SPOT will be working, tracking our progress through the Bahamas. That link is on our homepage.